Abissa In Grand Bassam Cote d'Ivoire is a dance and drum festival for seven days by the NZima people celebrating telling others the years problems. NZima people who speak the Nzema Language, The Nzema language, also known as Nzima or Appolo, is spoken by the Nzema people of southwestern Ghana and southeast Côte d'Ivoire. The Nzema are an Akan people numbering about 328,700 people of whom 262,000 live in southwestern Ghana and 66,700 live in the southeast of Côte d'Ivoire. Their language is also known as Nzima or Appolo. The Nzema are mostly farmers. According to their traditional calendar, days are ordered in cycles of seven, and these in turn follow each other in a three-week cycle. 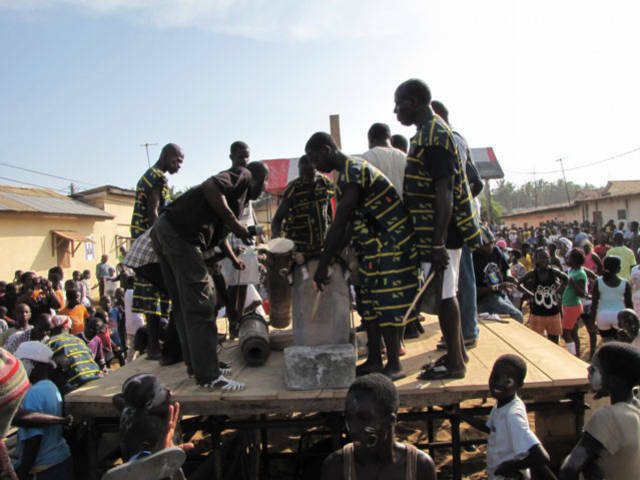 A religious kundum festival is held annually all over the Ahanta-Nzema area, starting in the easternmost part of Ahanta and advancing southwestward. Among other things, this festival is the main occasion on which the satirical avudewene songs are performed by young men. Lineage among the Nzema is matrilineal. To review the past year, and possibly terminate or injustice, or to confess publicly in the context of an apology to his family and repentance. Celebration of a time to tell others of transgressions they did or the ones you did, by words or mime. There is a parade that starts at one end of the village where a group of men drumming lead the path around Bassam to the center. At the center of the village the people start to circle the drums as Abissa starts. Dancing around Drums, decorating faces with Kaolin. Many of the men dress like women and the women dress like men. Absolution from "NYAMIE" for the misdeeds for ending year and blessing for the upcoming one. Every individuals has to repent publicly after the community may have pointed out his misdeeds for the elapsed year. This accusation-repentance ritual is a highlight of the ABISSA where people disguised into their relatives and mimic their flaws and vanities. is undoubtly the ancestor of the Carnivales celebrated by our cousins from the Caribbeans or from New Orleans. those who have contributed to its pride during the finishing year. They may be Artists, Scientists, Politicians, Business men or women. Whatever, women being considered in AKAN culture like the mainstays of the society are celebrated during two days every year. the AHENFIE (Royal court) procession and the public appearance of the King of the NZIMA KOTOKO are among the highlights of the ABISSA. bearer of the Soul of NZIMA people. Do the NZima people deserve to enter the NEW YEAR? If Edo Gbole answers yes, Bassam becomes Estatic.Typical Ivorian Barbecues, Beer, Concerts, Beach Bashes, this is another aspect of the ABISSA. The WOODY (Warrior), celebrating Male Physique beauty. West African Coast in the 15th century baptized APPOLO?